This hotel was very clean, rooms cleaned 8 days a week to a very high standard and all public areas were constantly being cleaned. The food was much better than I was expecting. The people who complained about it being burgers and nuggets were obviously just too lazy to go into the restaurant at lunch. The restaurant had a very large selection and the snack bars were mainly for the kids. The entertainment was good for kids which was ok for me as so long as the kids are happy then so am I. Complaints about staff not being friendly are stupid, not everyone can have a smile 24 hours a day and they all worked very hard. If you make the effort with them then they are lovely. The entertainers were very helpful and friendly. We went with First Choice and could not have asked for anything more from their staff, they were all fab. Would definately go again although not much going on outside the complex itself which is the only reason I probably will not return. We stayed for a week at the Lagotel and was very impressed, the hotel, the room, pool and grounds where impeccably clean, the reception staff where very helpful. The meals where very nice but to be honest we both expected more selection, as another person has said on here the deserts are to die for, the Creme Caramel was divine. The entertainment was not entirely to our liking with only a couple of decent shows all week, but the animation team where superb, of course with the world cup being on tv the bar was packed, one thing that could have been better is that they should leave drink lists for the AI clients as I ended paying &#8364;4.40 for a bottle of WKD and was only told it was not included as AI after the barman had opened it. I think the only thing against this hotel is its location, but if like us you have a hire car or use the courtesy bus its not that bad, otherwise it's a kilometer trek to the beach. This is one of the worst hotel's I have ever stayed in. The cleaners on my floor do not understand the word 'clean', I had the same filthy, stained sheets for the week, the shower was mouldy, the grouting was black and the balcony furniture was covered in ground in dirt. The only thing the cleaners seemed to do was empty the bins when they felt like it (every couple of days if I was lucky) and change the towels. If you like burgers, hot dogs, chicken nuggets and chips then you'll love the food, if however, you are vegetarian or want something healthy, eat out. The only hot veggie option most days was deep fried cauliflower or broccoli (mm healthy)and the standard of the food is poor. The main pool is overcrowded and unpleasant, however, the pool across the road is far nicer, more room and has the same facilities as the main pool (minus the annoying tanoy announcements and entertainment team). There are a few good points, the self serve drinks (everything apart from spirits) is great as you can take what you want when you want, if you do want spirits, the bar staff can be a bit rude at times. Another good point is that the pool area is locked until 10am, so no getting up in the middle of the night to save a sunbed!, there are also signs up to say no saving sunbeds, not that anyone takes notice though. The bus that runs to the beach is also great and I would recommend spending a few days at the beach as it is stunning. Overall, for adults this is a terrible hotel, if however you have kids and don't mind bad food then it would be o.k. as pretty much everything is geared towards kids. Im just back from lagotel a week and me my boyfriend & my family. We had the time of our lives!! Its was brilliant. this is our 3rd time at the Lagotel and as always we have returned very happy wanting to return next year.The hotel is spotless at all times of the day and rooms tidied and beds made daily. Food as always was lovely such variety and choice every night. The location was fine for us as we accessed the shuttle bus to the beach then went on public transport to our chosen destination.And besides its only a 10-15 minute walk to beach. The staff were polite and the children loved Pasquale he was excellent but has now gone back to his job on the reception. 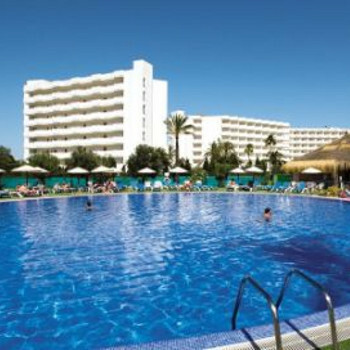 The pools are lovely the choice of a fresh water one or just across the road a salt water pool good for the kids as lots of varying depths of water always clean and plenty of sunbeds. Entertainment was good day and night always things to do in the daytime and my teenage son and my husband went rifle shooting and played various games.The night time kids disco was just enough for the kids with the first choice reps dancing. Local entertainment at night was good just what you need a nice cocktail and some abba or tom jones to dance to. We would definatley visit the Lagotel again we love it and experienced none of the negatives that other people had previously raised remember this is a family hotel so children actually playing and not being glued to there seats is to be expected. This was my 5th visit to the lagotel but after a 10 year gap. I was very happy to find that the hotel was still fabulous. Every public area and all rooms were spotless with cleaning staff always available if needed. I'm very fussy when it comes to buffets but this was an area that improved greatly. I stuffed my face!! One thing that amazed me was that some of the bar staff were still there after all this time. Juan and Rafa are sweethearts. The animation team offered loads of activities during the day and were great with the kids at night. Arrived home a few days ago from the Lagotel. We arrived late at night but was pleasently surprised by the clean lobby area, the welcome and quick check in from the reception. The hotel had also laid on a cold buffet which was very welcome has we was all starving. We was allocated a family room on the first floor which was the biggest room ive ever stayed in and overlooked the lake. My mum had a twin room which was also big but my sister-in-law had a single room on the 5th floor which was next to the maids store room which she said was noisey. The food was ok which made a change from cooking. Breakfast was the typical bacon, sausage and beans which the kids and my other half enjoyed. I had cakes and donuts, yes for breakfast! Evening meals had a good selection which included pasta, salads, soup and carvey. Beware of the deserts! They are sooo nice and you just cant help yourself from having to try every single one. We always managed to get a table at meal times but can imagine in peak season it being very busy. There was also plenty of highchirs. The waitress staff were lovely apart from one lady who cleared your plate away before you had chance to put down your knife and fork! The pools were lovely and a bit chilly but were fine once you got in. There was always plenty of sunbeds. We used the pools by the Breezers bar across the road because the kids liked them better and seemed a little warmer. The snack bar by the pools were quite reasonably priced too with a choice of baguettes, burgers, hotdogs and chips. We did got the hotels evening entertainment a couple of nights, especially the night when it poured it down with rain, and it wasnt too bad but was very busy with alot of kiddies screaming and flying around but hey theyre on holiday too. They had a acrobactics act and a reptile act which the kids loved. The on site supermarket had a good range of items you would find at home. Some were reasonably priced such as beans and bread but others not like shampoo and baby food. We took our 9 month old baby and the baby food was priced at 3 euros a jar! Would imagine it would turn out quite expensive to go self catering. Overall it was a lovely holiday and we all had a good time. I had read all the reviews before we went and i never saw any unruly teenagers and the power station didnt spoil our view either. But then again we did go out of peak season which i think is the best time to visit. Another fantastic stay at this hotel. Food is excellent, and the entertainment is improving. Helpful and friendly staff always available to help you if necessary.